ERC-TECH know-how meets the requirement for circular economy in the construction industry, because it poses no environmental or economic burdens, but instead is an opportunity and resource which turns reuse into profit for companies, municipalities, regions and planetary society as a whole, while fully complying with requirements for sustainability in the construction industry with a great environmental benefit. 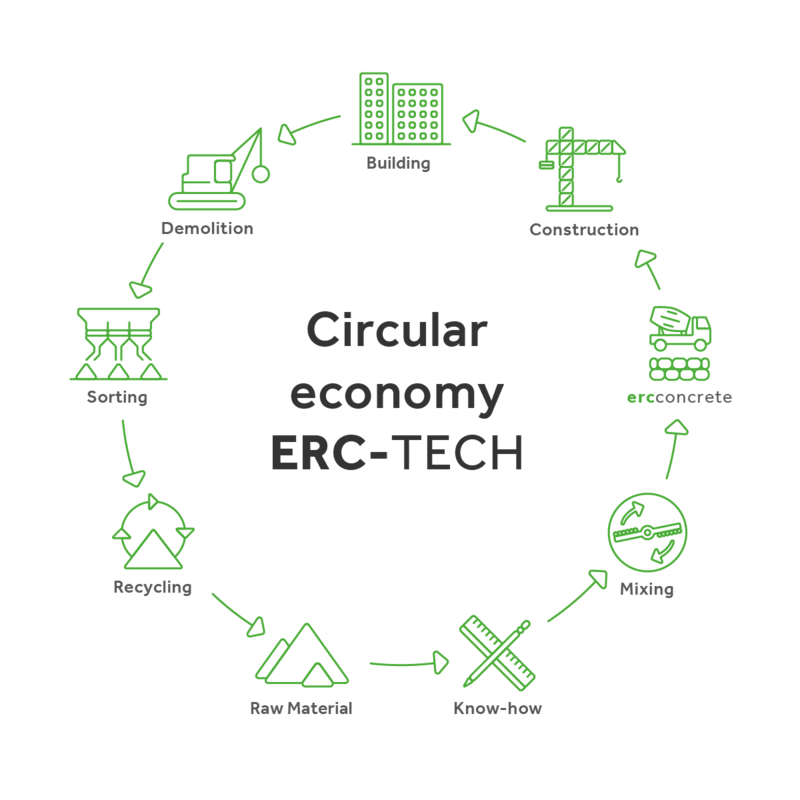 Instead of mining mineral resources and expanding landfills, ERC-TECH concept of circular economy promotes prevention of waste generation, reuse of products, recycling them and turning them into values. In the ERC-TECH technological design, they are products for all types of construction work. LCA (Life Cycle Assessment) is a compilation of assessment of inputs, outputs and product system in terms of possible environmental impact during its life cycle. Products made according to the ERC-TECH know-how are less energy and money-demanding in their processing and production than products made from traditional materials. Products made according to the ERC-TECH know-how are again fully recyclable after the end of their life cycle, and usable with very high benefits in terms of the life cycle. Products made according to the ERC-TECH know-how ensure continuous product life cycle in terms of environmental impacts based on the “circular economy” trend and their applications achieve the highest LEED and BREAM levels of the Green Building Council. LCT (Life Cycle Thinking) is about overcoming the traditional focus on products and production processes so that they involve environmental, social and economic impacts of products on the entire life cycle. By means of LCA, ERC-TECH has tested the impacts of its circular business models and can confirm their assumptions with a feedback for improvement. In addition, we can define goals and indicators that would measure and support circular economy over time. ERC-TECH has assessed the impacts of circular economy as part of its LCA approach – the life cycle values, and they are highly beneficial. LCA by ERC-TECH may boost further development and designs of circular economy.